I may have to apologize in advance for the brevity of this post as I am typing this up a bit late after two very long days of work. I am looking ahead at the next two weeks of October and though there are some pretty exciting things coming up for the month, it's also a busy one for both the blog and my actual job so things may get quiet here. I've never been one of those bloggers that could pump out a post for the sake of pumping out a post as this place is a journal of sorts for me and I don't like sounding forced. Moving on to ManiMonday, I am feeling a little nostalgic with today's manicure because flakie polishes were really trending 3-4 years ago and though they are still super cool to look at, they have faded even from the indie polish scene. Flakies are kind of a cool form of nail art because they look like shards of iridescent shards of roughly cut glitter. Violet Galaxy* from nail e-talier Born Pretty is an intense flakie polish in that it sits in a clear base but has concentrated chunks of flakes allow you to use even just one coat to achieve this geologically raw look. I have always found that flakies layer best over top black polishes, but white or blue can work as well. I love black because you can see the entire rainbow in the light so here I am using Sally Hansen CSM in Hooked on Onyx*. Add a shiny or matte top coat to finish the look and admire the wonder is that is now your manicure! 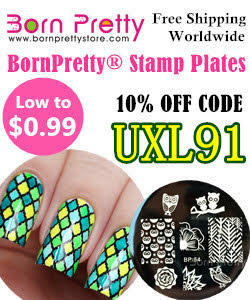 Use code UXL91 to save 10% on your purchase!